Hello and Happy Tuesday! 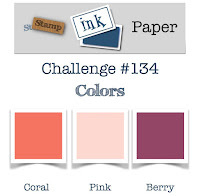 It's time for another Stamp, Ink, Paper Challenge and this one is a cool color challenge! Check these colors out... how fun!!! I just received my order from Gina K Designs and was super excited to use this Geo Thanks set with the challenge! Claire Brennan is an amazing designer! I think I have almost every set she has designed! Check this one out.. fabulous, right??!! I was originally drawn to the feather in this awesome set but with this week's color challenge I felt like the hearts would be perfect! I was originally going for a Clean and Simple Design but my splatters really got in the way of the "Clean" part! Oh well.. I still love it. I used a card base of 110# Neenah Classic Crest Solar White Cardstock measuring 11" x 4 1/4" and scored at 5 1/2" for a top folding card. 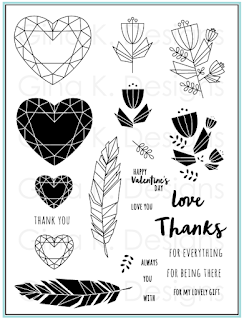 My stamped panel is Bristol Smooth Cardstock and I stamped the small outlined heart three times in Versafine Black Onyx Ink and then clear embossed them. 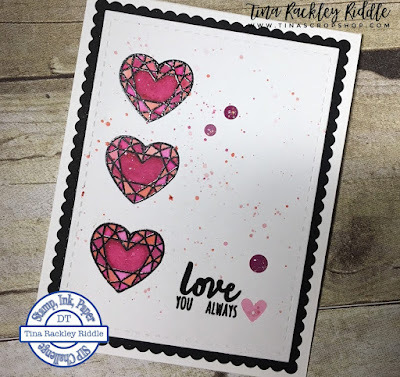 I used an Aqua Painter and SU Berry Burst, SU Calypso Coral and Tim Holtz Picked Raspberry Distress Ink for the watercoloring. The splatters are Berry Burst and Calypso Coral and I also used my Aqua Painter to create those. The sentiment was stamped in Versafine Black Onyx and clear embossed. I added a few SU Glitter Enamel Dots and a heart sequin from a recent Hero Arts kit.